If you love adventure then New Zealand is the place to be! We had a dream of taking our honeymoon in New Zealand and while we had no idea how we were going to pay for it we knew we had to make it happen. We wanted to pick a place that neither of us have been to and could have some exciting adventures as well and New Zealand is the perfect choice! Luckily we found out about Traveler's Joy and they helped our dream come true! We spent 12 adventure packed days (11/16/09 -11/29/08) in New Zealand seeing both the North and South Islands. We left for New Zealand the day after our wedding on November, 16, 2008 because of crossing the International Date Line our New Zealand adventure began on November 18, 2008. We got off our flight at 5:30am in Auckland to immediately jump in our rental car and drive across the country (really only a 4 hour drive!) to hot water beach! What we didn't know was that we would have to wait 6 hours to see that hot water! So I suggest researching tide times for anyone wanting to check it out! Luckily we saw a sign for Cathedral Cove a mile down the road and thought to check it out. It was AMAZING! The views were absolutely incredible we were literally walking along the edge of a rainforest and to the right of is the Pacific Ocean! We quickly found out that New Zealand is covered in beauty and almost every corner you turn takes your breath away! We then carried on back to find our B&B for the next two nights and found that we actually had our own cottage! We were staying at the Kamahi Cottage right outside of Waitomo. We got settled in and finally were able to crash because the next day the adventures began! Our second day we jump right into our extreme adventures with Black Water Rafting in Waitomo. We did the Black Labyrinth tour! The first thing they had us do once we had all our gear was to go to a ledge and jump backwards into the river below. Why you ask... to practice for when we are in the caves and have to jump down waterfalls! That's right once we got into the caves where it was so dark you couldn't even see your hand in front of you we jumped down 2 waterfalls! I highly recommend this trip as the glowworms you see are so serene and then you get the adrenaline rush of ducking in the caves and jumping down the waterfalls is a great mix! To recover from an extreme day we took the next day at leisure to drive to Rotorua! We did finally get a chance to see a hot water beach as well! I wish we had those at home! We got there when the tide was low and just started digging a hole. After awhile hot water started to bubble up in the hole! Once we had it big enough for both of us to sit in it we got in and again an amazing experience! Sitting in a hit pool while watching the ocean waves crash just a few feet in front of you is an amazing experience and one I will never forget! We then carried on with our road trip to Rotorua and found even more fun along the side of the road! We saw a sign for a waterfall that said it was only a 5 minute walk. We figured that it would be a little trickle of water but could still be cool so we stopped. It was HUGE! We sat in awe for a good half hour just watching the water fall down the rock wall surrounded by vibrant green rainforest just waiting to wake up from this dream! Luckily it wasn't a dream and we carried on a mile or so down the road where we saw another sign. This one spoke of a natural bridge which we of course had to check out. And it truly was a natural bridge, a rock had formed this bridge between two hills I would say, either way it was really cool to look at! Behind it was a huge sheep farm and we laughed at all the crazy contraptions they have there to keep sheep where they need to be! We took one last detour on our way to Rotorua and that was too a kiwi sanctuary. This place was high security! Tons of gates to walk through and then a million dollar security fence that runs the entire perimeter! The whole point is to keep predators out from getting the kiwi. We walked around in this oasis for while hoping to see a kiwi but had no look. We finally carried it on and made it to our B&B the Kotare Lodge in Rotorua. The next day we decided to really pack it all in! We began the day with an air safari tour! The boat plane actually picked us up from our front door! So cool! We got to cruise around and check out their volcano that erupted over one hundred years ago now. I was expecting lava but it has all cooled down and just had really interesting formations and colorings! We also happened to time it right so we saw the daily geyser burst as we flew overhead! We then got off the plane and went straight to the Zorb site! Zorbing is basically where you get a large hamster ball looking contraption filled with water and then you roll down a hill! (www.zorb.co.nz) I was a bit nervous at first but once you get in there you can't help but laugh! We chose to do ours together and we laughed so hard we were almost crying!!! After that we decided to squeeze in some more hiking before our big dinner that night. So we drove over to Waimangu volcanic and thermal valley. This was about a 2 hour hike that had 30 or so stops. I think I took about 100 photos here! The place was amazing it is created from the volcano eruption 100 years earlier and is constantly changing! (www.waimangu.co.nz) The most amazing was Frying Pan Lake, a huge lake that is literally steaming hot! When we were there it was 89 degrees Celsius! Once we made it back to the top we drove back to our B&B to get changed and ready for our cultural experience! We were heading to a Maori hangi! (www.mitai.co.nz) They cook all the food underground and so while we waited for it to finish they walked us over to a river running through their camp. Here we got to see the Maori's come out on their Waka (canoe) as if they were coming home for the day. We were then lead to the camp where they treated us to the Haka which is a sort of dance they do but it was done to scare off those trying to come into their land. The whole point is to scare them and make them think that the intruder looks delicious... and let me tell you it worked! They look very scary when doing it AND as if they are about to jump down and eat you!! 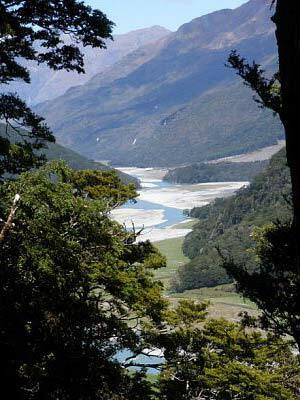 Our first adventure here was the dart river tour. www.dartriverjetsafaris.com/dartriver/) This a huge river where we had to hike out to the drop off point and this is where things really began to feel unreal because we were walking in the forest where they filmed Lord of the Rings and we began to feel as if we were on a movie set because mountains cant possible be that tall! It happened to be a cold and rainy day (the only one while we were there) and so we couldn't see as much as we would have liked but that definitely did not deter us from having fun! Once we were in the jet boat all we could do was hold on and scream!! They would spin 180's on the river and jet us from one incredible location to another! My only regret was that we were going to fast I thought I would lose my camera so I didn't take any pictures! The next day was another relaxing day. We spent the day wine tasting in the Central Otago Valley. (www.winetoursnz.com) Let me just tell you that their wine is superb! I love red wine but have never been too fond of white but boy when I tried some of theirs it became my new favorite! I was just sad that we were only allowed to take 2 bottles back with us on the plane!! After the wine tasting we went to a cute little town outside of Queenstown called Arrowtown. Here we found the blue door, which is just that, a huge blue door! What is special is what is behind the blue door if you open it you become pleasantly surprised to find a quaint bar with barrels for seats, a roaring fireplace, and yes amazing wine! It was a great place to wind down the day! Our next adventure was the Siberia Experience where trekked around for four hour in Mount Aspiring World Heritage National Park. This was a unique experience as it involved air, land, and water! We started by jumping in a plane and flying over the national park. The pilot landed us basically in the middle of nowhere and said ok across that river is the path it is a 2 hour hike, now go! So it was us and one other couple so we braved the FREEZING river and crossed it to the other side and began our hike. What I truly loved about this was we had no guide. We had the chance to just take our time and walk through at our own pace. We had brought food se we stopped and had a little picnic right there in the park among all the natural beauty. Finally we made it back to the pickup spot for the jet boat. We jumped in and zoom we were off! Zipping through the braided river where many times I thought we were for sure going to run into something! Luckily we didn't and we made it back in one piece but with our hearts just pumping away!! Our last activity became our favorite and again it was an unplanned journey. When we were staying at our B&B in Queenstown we saw photos in the room of this magical looking place. We inquired about it and found out that it was the Doubtful Sound. 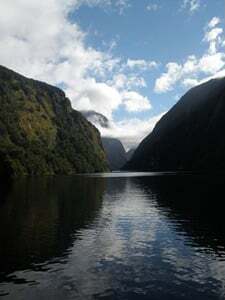 Now New Zealand is known for the Milford Sound but they told us Doubtful was where the real beauty was. So we couldn't resist and just HAD to see this place so we canceled our last activity to switch it with an overnight cruise along the Doubtful Sound! (www.realjourneys.co.nz/main/doubtful/) All I can say about this trip is breathtaking - if you have the opportunity to ever be in New Zealand this is a must do! We were able to kayak through the sound, see the rarest penguin in the world; we even saved a sinking ship! (Though I don't think this is a part of the normal itinerary), and it ended our trip in the best way possible. It is a place where whether or not you believe in God you can't help but feel some sort of higher presence. It was truly a magical place that will stay with us forever. There is one last part of the trip that I didn't really touch on that I want to. While it wasn't an activity it is what made our experience the absolute best and that was our B&B's. 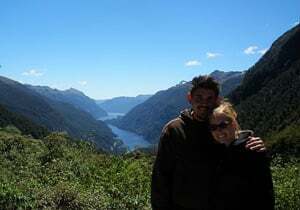 We chose to do B&B's because we wanted to get that more homey feel on our honeymoon and really get into the New Zealand and stay with locals who could hopefully show us a few hidden local treats. We ended up stayed at the most amazing places with the most incredible people. They all welcomed us into their homes and truly made us feel at home. The best meal we had on our entire trip was the meal cooked for us at Riverrun in Queenstown. She made us a home cooked meal of meat pie and it was the best thing I think we have ever eaten! The host always gave great advice on where to go and a lot of them are responsible for us seeing some of our favorite parts of this country. It would not have been the same trip had we stayed in hotels, the B&B experience is what made this honeymoon an absolute dream come true! Our honeymoon cost around $6,000 and that included our airfare to New Zealand. We truly had the best honeymoon ever (though yes I am sure I am biased)! We loved New Zealand so much we left already having planned about 3 more return trips! I would highly recommend New Zealand to anyone who has a little bit of adventure in their hearts. Though New Zealand is known for their adventurous nature they really have heart, New Zealand is filled with some of the nicest people we have ever met! After all the hecticness of the wedding being able to take 2 weeks in what I believe one of the most beautiful countries in the world was a once in a lifetime chance and because of Traveler's Joy and all our family and friends who got SO excited about our honeymoon they helped us make our dream a reality.